Jon commented that today’s visit was more confusing to see on the monitor because they’re getting so big. 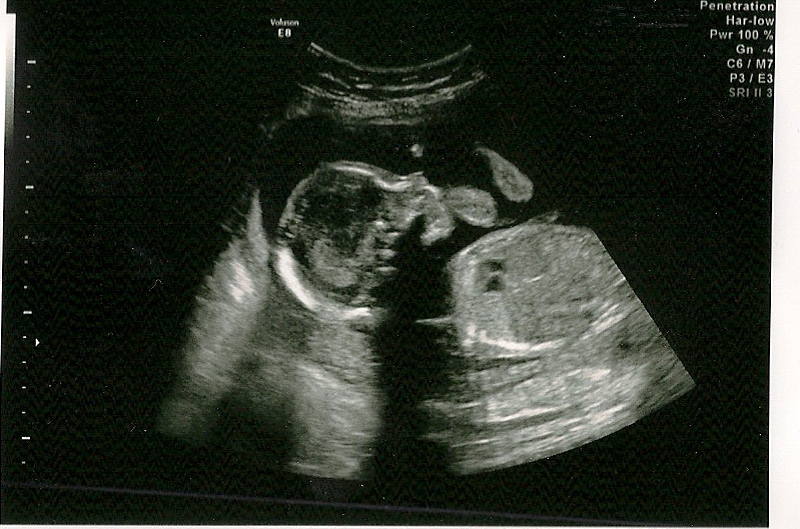 At 21 weeks, our big boys weigh 13 and 14 ounces respectively – almost a pound each. And yes, for all those wondering, they are still both very much boys. They have both been very active lately. I can now feel them kicking. It’s still relatively subtle, but medical staff has assured me they will start getting in some significant punches as they continue to get bigger. They tend to start the day’s exercise practice right as I’m going to bed. They also appear to react to up-tempo music. Perhaps we will have one musician and one athlete – Or two musical athletes! Regardless, I am now convinced they will both be gifted and talented studs. Cool, calm and collected: Baby A sucking his thumb. Fired up: Baby B mid-flail. Completely unsurprising, Baby A waved at us. During the first glance with the magic ultrasound wandy thing he seemed a bit annoyed to be disturbed. But then again, that could also be attributed to the swift front kick to the head provided by his brother. Even the technician laughed at this one, commenting, “Wow. Get rid of all your nice furniture – these two are going to be all over the place.” Wonderful. They’re not even born and they’re little hellions. Karma . . .
As always, B was uber bouncy. I could see B stretching, kicking and bouncing from the first moment the visit began. 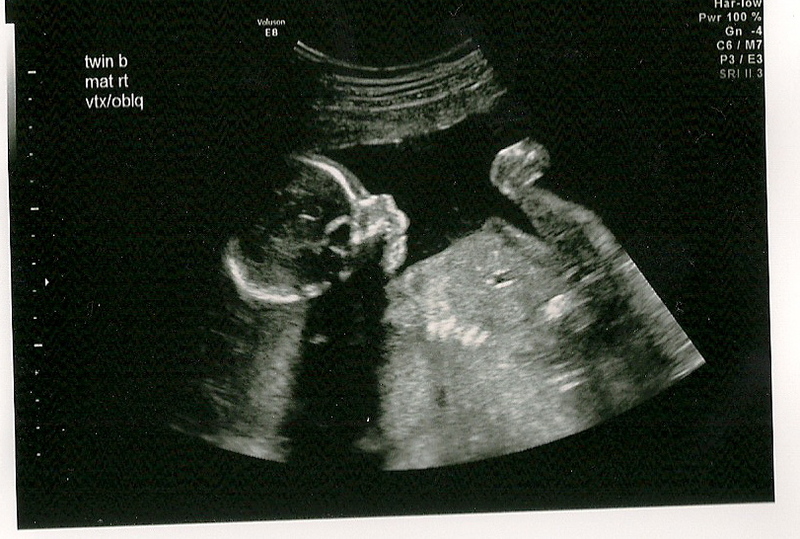 Even during the measurements of A, we kept getting glimpses of B’s cute little feet. He has been this active since our first lima bean viewing at six weeks. Something tells me we’re going to have a serious mover when B gets this mobility thing figured out. When the doctor came in to confirm the tech’s pronouncement that everything looked great (which was the correct response regarding the munchkins), she chuckled, saying we were going to have some adventures with these two as they’d managed to change positions a minimum of seven times during the 45 minute procedure.